Was he waiting for a golf cart to show up & lead him to the store Jim? No, but I might be. Nice shot and a nice area. The Villages, Fl. Old people on healthy retirements. It appears Publix is sticking with Freightliner as the truck of choice. Shot this FL Cascadia MK II at the Savannah GA Welcome Center/rest area @ MM 110 on I-95 while the driver was taking a break on 2-21-19. I like Publix trucks but wish they'd inject a little creativity in them from time to time. 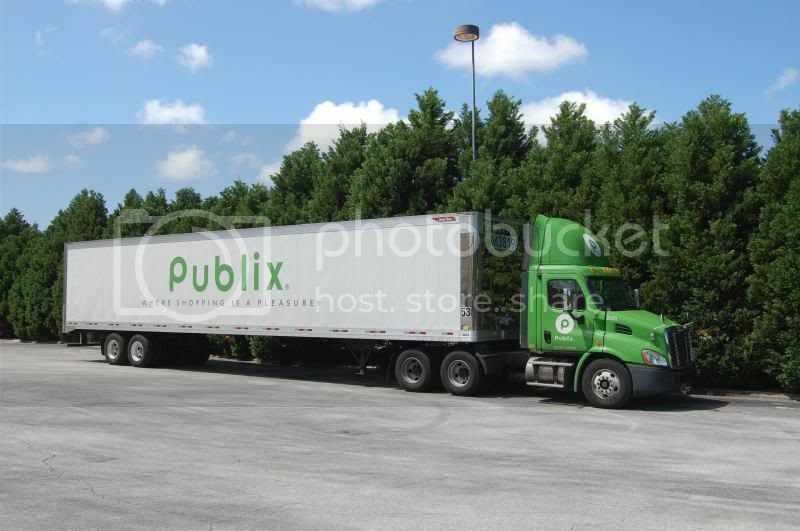 In FL I've only ever seen 100 green Cascadia's with the white trailer/Publix logo. Just this week saw some Publix rigs in Richmond being pulled by daycab Ruan Cascadia's. Seems Publix is trying to creep a little further north, although idk that I'll ever see them in NoVa.